An intensive care unit for Tokyo Bonsai and home of the masters of bonsai, Omiya Bonsai Village is a special destination. 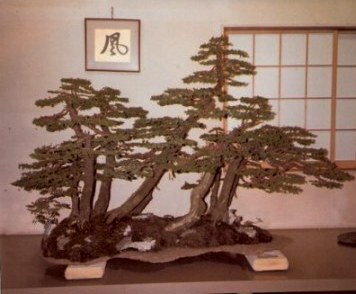 It is said that in Japanese culture, the bonsai tree symbolises harmony: a balance between nature, man, and his soul. In Omiya Bonsai Village you experience this in a unique and peaceful adventure into thoughtful appreciation of years of the plant and the person working together to form great art. 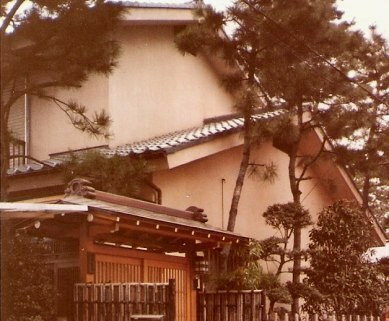 Apart from the Tokyo Fish Market, the other interesting place I wanted to see when I was in Tokyo in the 1970s was Omiya Bonsai Village. 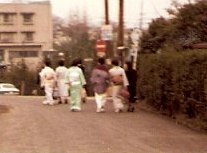 At that time I did not have such a good camera, but still captured some of the adventure on film. My friend who lived locally and was learning Japanese, knew a relatively quick way, but decided that my old Fodor’s instructions gave a more interesting route. 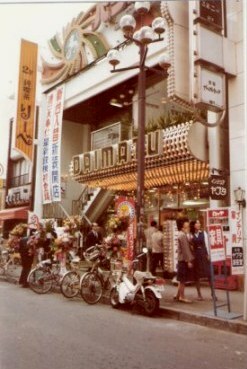 We had an adventure getting there, passing a neighbourhood Diamaru that made an interesting contrast to the facades of the city streets - and tot he great department store of the same name. 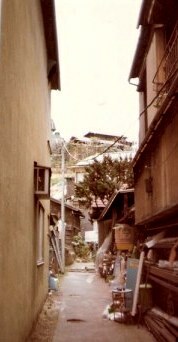 Looking down the alleyways just around the corner, there, just as it would be in any city - was another side of Tokyo to see. 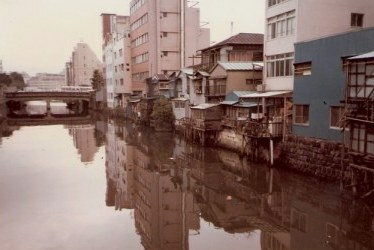 We passed houses along the river between the fish and general markets. 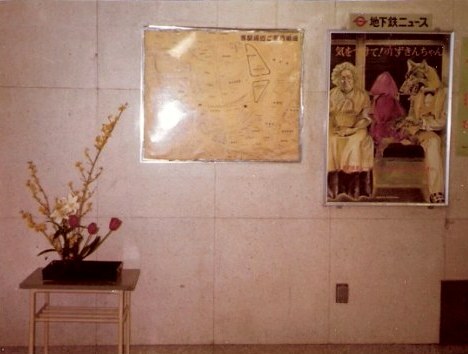 In the subway, a railway worker had an Ikebana flower arrangement beautifully created under the subway map. On the wall above was a poster warning to beware of wolves on the train – using the Western story of Little Red Riding Hood as the analogy. At the time it was fashionable to use western stories in this way, but there was an outcry by foreigners when The Last Supper was allegorised, with all sorts of lost property piled up on the table in front of the outstretched hands of Jesus. Roughly translated, that poster said not to expect the Lord to look after your personal goods and not to leave them on the train. I think the meaning of the poster shown here is quite obvious in all languages! 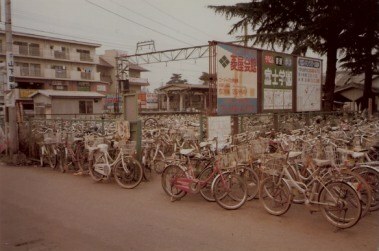 At the railway station I wondered how anyone knew which bike was theirs when they returned home from work. But on crossing over the line there were even more bikes on the other side. On the outskirts of Tokyo there were some lovely detached houses. We passed a giggling group of girls in traditional Kimonos, their wooden Geta (platform sandals worn over Tabi or socks with a split for the toe) clattering on the roadway as they hurried past. My first pair of Tabi was in red velvet, given to me by my father when I was 8 years old. Despite my Fodor’s guide, we had walked ourselves into a muddle. My friend had to ask some policemen for direction. One held a well-cared-for police bicycle that was so old that written along the diagonal bar was the phrase: 'Finest precision mechanism': truly a symbol of past marketing-speak. 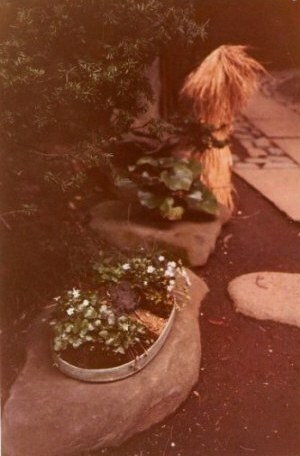 As it was not quite Spring, there were not many people about when we finally arrived at Omiya Bonsai Village.The chill in the air meant that many of the plants in the ten or so private gardens were still under their protective and very decorative warppings of straw. 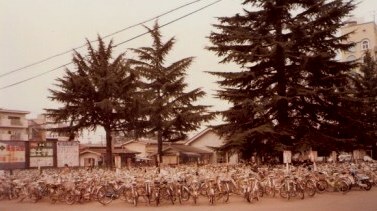 The village was created after the Great Kanoto Earthquake of 1923. At that time, new residents witht he same passion came to join the original bonsai gardeners who had chosen the site for its clean air, and the availability of land and water suitable for bonsai growing. 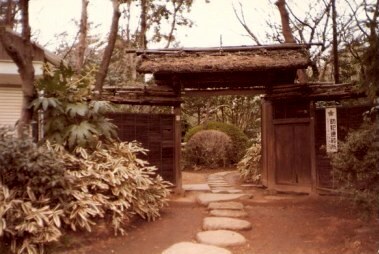 Here, even the houses seemed to be framed by bonsai shapes. there were to be only single floor dwellings. 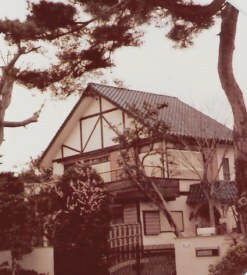 This exquistely framed, but double storied house was on the village outskirts. 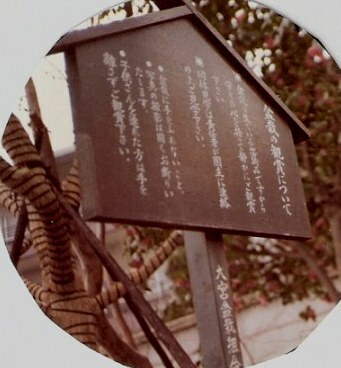 With no knowledge of the language, the signs were not much use to me, but I was fascinated with the care and thoroughness with which delicate trees had their branches bound to protect them from the winter cold. I tried to bear it in mind as I ventured forth. There were benches and stands with individual trees. Behind them, the trunks and branches of the larger garden trees were protectively bound against the frost. Even the garden taps had been wrapped for the winter: this one under a little haystack all of its own. There are said to be many thousand bonsai in residence here, and it is a big attraction for bonsai enthusiasts from around the world. I had been told it was a sort of intensive care unit for smog-bound Tokyo Bonsai plants, and that their owners often brought them here to be restored and to convalesce. 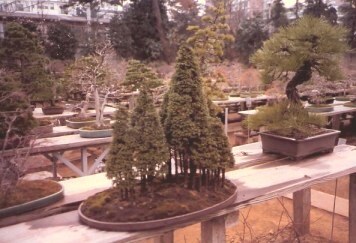 In addition to the single bonsai trees, there are small forests of conifers. Some of these stood outside on benches. Inside, this one was carefully arranged beneath the Kanji script and a bamboo and rice paper screen. 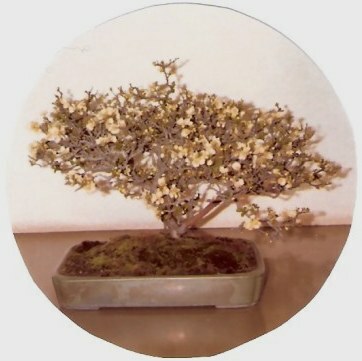 Omiya acknowledges and fosters the unique character and personality of every Bonsai plant. 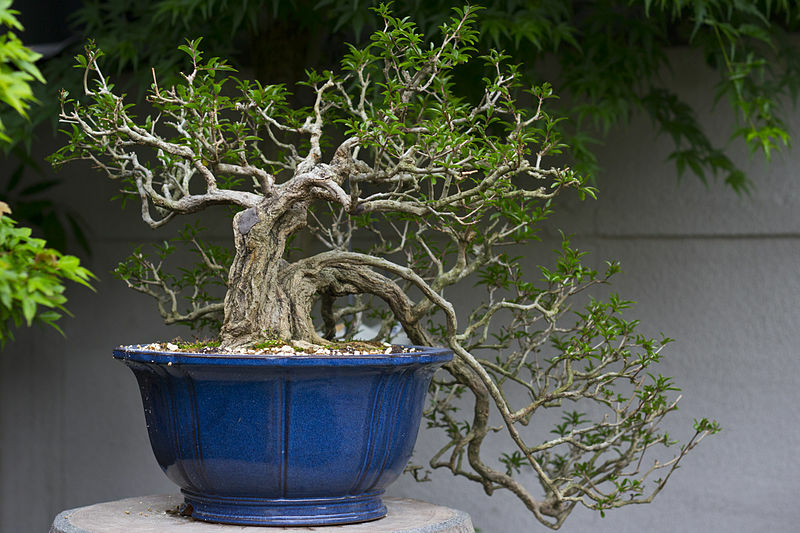 Bonsai Masters understand that each tree is not like the next – but has a personality of its own. 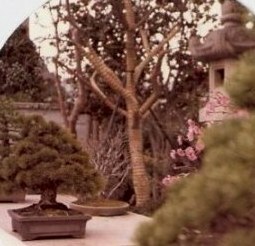 The art of the Bonsai practitioner is to make an ethereal connection to the spirit and character of each tree, and to each tree in a different way at each level of maturity. 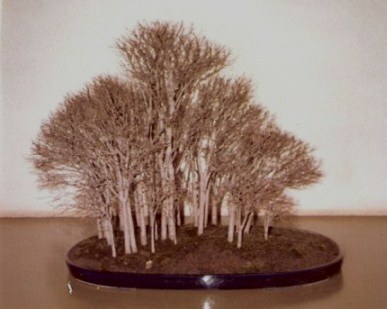 I think Bonsai is a serene art that makes a good analogy as to what we should seek in life, with each individual. "Ladies, I think we must be careful about making judgements of the young, for we all have sons – and their race is not yet run". She could have been a Bonsai Master, for she understood the truth that we all change with maturity. Those close to us will accept those changes and understand that not all will be beautiful, but believe in the rightness of the eventual outcome. Still seeking what the Masters sought in their art, I wandered further into the village. There were hundreds of small trees. Some were growing on stones, clinging to the side of moss covered rock. These rocks or Suiseki stone are what the Chinese would call a Scholar’s stone -gōngshí. This is a stone that has a semblance to something physical: like a person, an animal, or a mountain. The word Suiseki itself is a composite of Sui meaning 'water', and seki, meaning 'stone' – reflecting the basis of what most usually forms the stones into interesting shapes. 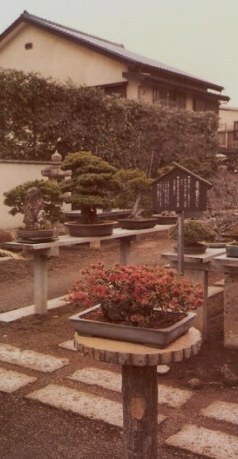 Bonsai is often said to be 'Heaven and earth in one container'. An underlying belief for success is that one must have three basic virtues: shin, zen and bi : truth, goodness and beauty. The off-centre placement of trees in their containers reflects respect for the centre point. The centre point is where heaven and earth meet – a place that should be left free. It also gives pleasing visual asymmetry, just as the triangular frame of the whole gives balance. This triangular frame also reflects the relationship of the deity (or life-giving universal principle), the tree itself, and its artist. This holds true even for small forests like this one of silver birch, waiting for spring. On one side is the tree and the earth in which it is planted – and on the other, the person who works with its nature to artistically form and shape it. 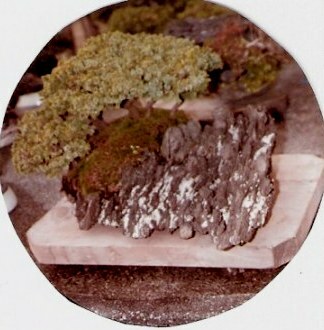 In Bonsai, as in life, there is no finished product. you must hammer and forge yourself into one. Like Bonsai, character building is one of the few places where form does not follow function – it emerges – a direct result of how you respond to the things that shape you.